Have you heard of The Epicentre? I discovered it last year at FireHouse Gourmet when I was on the hunt for the perfect chili powder for my United Way Chili Cook-Off entry. Not only does The Epicentre have awesome products, and a huge variety to choose from, but these hand-blended spice and herb mixes come straight outta Birdgenorth. How amazing is that?! I seriously use their premium chili powder in everything: omelettes, roasted vegetables, meat rubs, sprinkled on pizza before baking. But the pasta sauce – man, you can’t beat it! One day I was making up a batch of chili (with my Epicentre blend, of course! ), when Sean came into the house and said “Mmmm… It smells like Jim’s Pizzeria in here.” BAM! The secret to their delicious sauce was revealed. Now, I even sprinkle this chili powder into jarred pasta sauces to bring it up a level. Here is a great recipe for the best pasta sauce you will have in your LIFE. 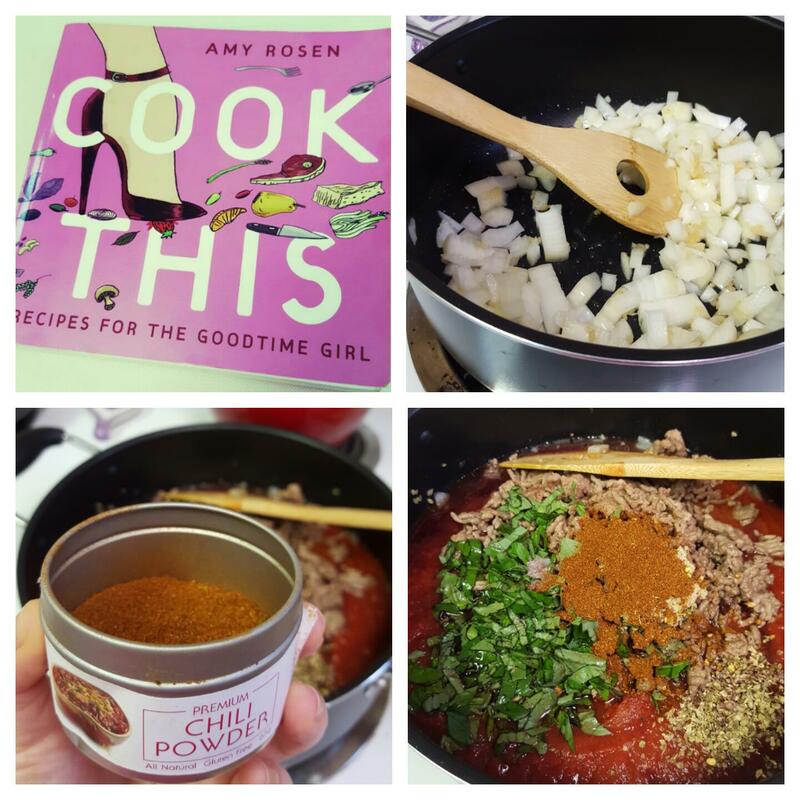 It is adapted from my favourite cookbook “Cook This: Recipes For The Goodtime Girl” by Amy Rosen. If you don’t have it, go buy it. Seriously. I made two recipes from it just this morning – this pasta sauce from her lasagna recipe (which held up to the discerning palate of an Italian couch-surfer), and banana muffins. Meanwhile, heat the olive oil in a large pot over medium-high heat, add the onions and garlic and cook for 5 minutes, stirring often to ensure they don’t burn. Drain beef and add to the pot once the onions have softened. Add in the rest of the ingredients. Bring sauce back to a boil, and then turn down heat to let simmer for at least an hour. Give the sauce a taste, and adjust flavouring as required (more salt, pepper, sugar, chili powder). Use in your favourite pasta dish! Make sure you check out The Epicentre Online Spice Shop (they also have a great Facebook page where they post recipes! ), and their free e-book called SPICE that you can download on their website. I can’t promise great meals every night, but there’s an open invitation whenever you guys are in town! Dinner is served by 6:39! Previous Previous post: Las Vegas, Baby!